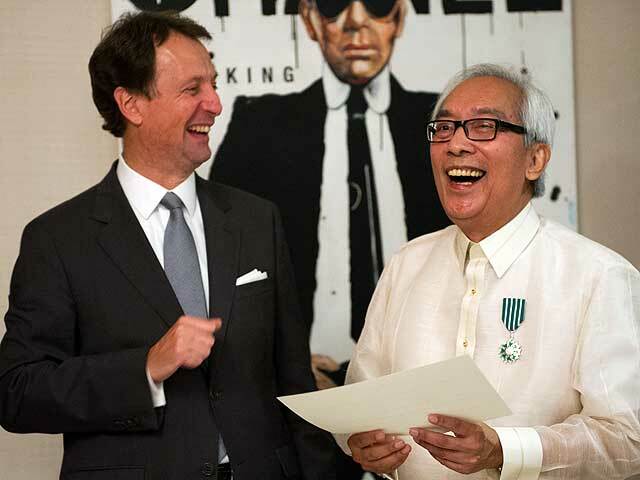 ICOMOS Philippines President Augusto Villalon was awarded the Chevalier de l'Ordre des Arts et des Lettres, conferred by the Minstry of Culture of France to individuals who have excelled in their fields of endeavor and who have promoted France. Established in 1957 by the French Ministry of Culture and then President Charles de Gaulle, the Order is in recognition of significant contribution to the arts and literature, or the propagation of these fields. The citation says that Augusto Villalon has worked tirelessly in the practice of architecture and protection of heritage in the Philippines, in France and all over the world through his work as an architect and writer, and also involvement as the NCCA Commissioner representing the Subcommission of Cultural Heritage, as the Commissioner for Cultural Heritage of the UNESCO National Commission Philippines, as the Philippine representative to the UNESCO World Heritage Committee, as the President of the ICOMOS Philippine Committee and as Member of its Executive and Advisory Committees in Paris.